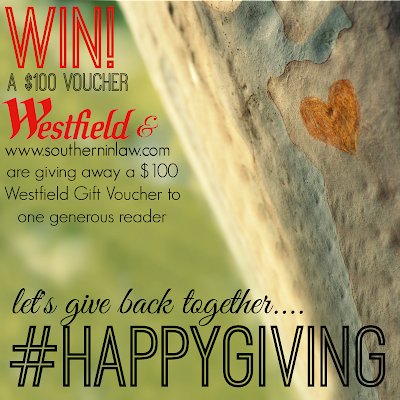 Southern In Law: #HappyGiving - Win a $100 Westfield Gift Voucher! 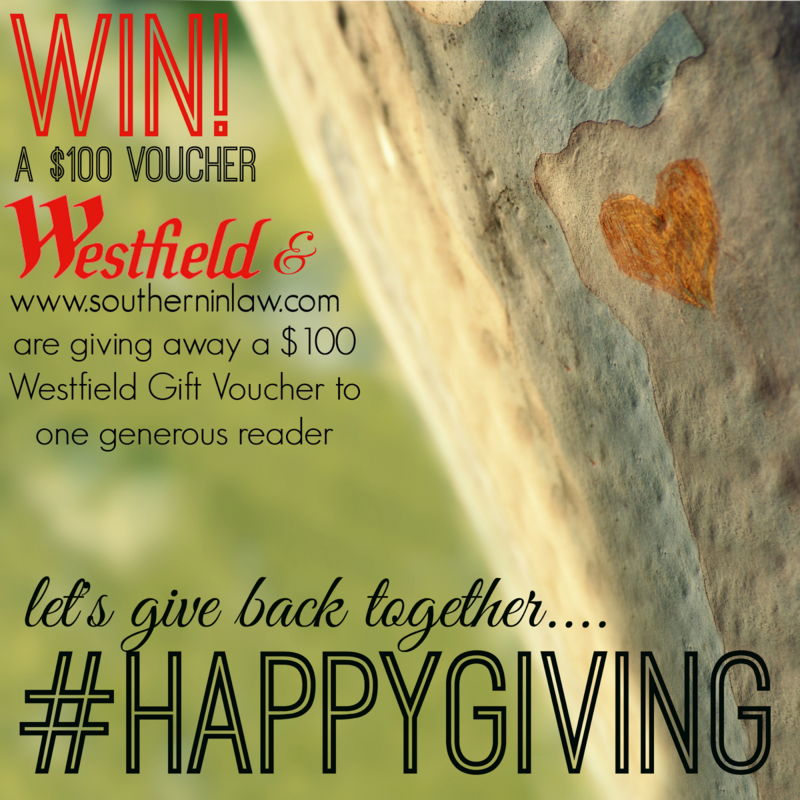 #HappyGiving - Win a $100 Westfield Gift Voucher! Hey, loves! I'm excited to be teaming up with Westfield Australia for this fantastic giveaway. This holiday season, Westfield wants to celebrate the thoughtfulness behind every act of giving this festive season with #HappyGiving! To celebrate, Westfield and I want you to tell us how you'll be sharing the gift of giving this Christmas for a chance to win a $100 Westfield Gift Card. Step two: Leave a comment (or Facebook Message/Email if you prefer privacy) telling us in 25 words or less, How are you going to share #HAPPYGIVING this Christmas if you win the gift card? Please make sure you leave a way to contact you - an email address is preferred, however, if you copy and paste your entry on this post on Facebook that would be perfect too! Step three: Practice #HAPPYGIVING this festive season and watch the smiles grow on the faces of those you love. Competition is open to Australian Residents and closes on December 10th, 2013 at 11:59PM EST. The best valid entry will be selected as the winner by Kristy, Jesse and Westfield and notified via email. Should the winner not reply within 14 days of contact, an alternate winner will be selected. Please note: the winner must be a valid and current liker of the Southern In-Law Facebook or other relevant social media pages at the time of competition's close. Happy giving is heart giving... part of our family xmas giving are donation vouchers for Oxfam, World Vision, WWF etc...smile presents we call them! Countless fire victims in the Blue Mountains without even a hairbrush or shoes. $100 would buy them necessity goods that we take for granted. If I won the gift card I would share in the #happygiving by donating it to the Ronald McDonald house to get gifts for the families staying during the holiday season. In my family, gifts are given with the best of intentions but are often really unsuitable for the recipient. As a result, one person has suggested 'no gifts for adults' - but that's no fun! A Westfield gift card would be the perfect excuse for the family to go Christmas shopping together ensuring a #HAPPYGIVING result for giver and giftee! This year is a hard time for my hubby's best friend, whose dad had a car accident. I would give this voucher to him. My work always organises a gift and food hamper for a family through St Vinnies for Christmas. I love getting bits and pieces all year to put aside for the hamper, but if I won this, I would go on a bit of a shopping spree to get somethng really awesome for it! Sorry, didn't remember the 25 word rule, please disreguard my previous comment! I would shout my mum Christmas lunch rather than her slaving over a hot stove for me. We've come up short this Christmas - are only getting little presents for the kids - I'd use this so they don't feel Santa left them out!